The works of Vincent Van Gogh included included still lifes, landscapes, portraits and self portraits, and his use of bold colors and dramatic, expressive brushwork were beyond influential - he has been called the father of modern art - and his relatively short life that was plagued by what was likely a combination of bipolar disorder and temporal lobe epilepsy, not to mention his meager lifestyle due to poverty, make him all the more fascinating a figure. He's practically the archetype for the starving, suffering artist, and the romanticism that has become attached to him over time is as fitting as it is unfortunate, as there is nothing romantic about the kind of depression he suffered from throughout his short life. John Sessions as Père Tanguy. 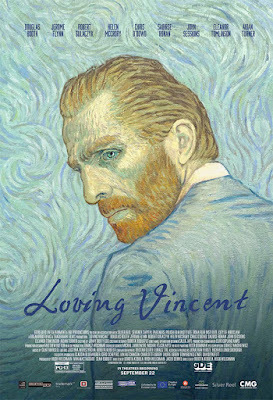 Set one year after the death of the great artist, Loving Vincent begins with Postman Roulin (O'Dowd) requesting that his son Armand (Booth) personally deliver Van Gogh's last letter to his brother, Theo, after previous attempts to mail the item failed. Despite not having been fond of Van Gogh and recalling the incident when the deceased mutilated his ear and gifted it to a local prostitute, Armand begrudgingly accepts due to his father's affection for the painter. Postman Roulin acknowledges Van Gogh's mental illness and blames the other townspeople for ostracizing and driving him out. He also expresses bemusement about the cause of Van Gogh's death, as he had received a letter from him six weeks prior to the suicide that showed him in a calm and normal mood. Armand visits Père Tanguy (Sessions), who informs him that a depressed Theo, who suffered from syphilis, rapidly deteriorated in health and died shortly after his brother. While describing Van Gogh's funeral, he mentions that Dr. Gcthet, who housed Van Gogh after his release from an asylum and shared a mutual love of art with him, had treated Van Gogh as family and had been visibly distraught at the funeral; Tanguy recommends that Armand get the forwarding address for Theo's widow and child from Dr Gachet. Armand travels to Auvers-sur-Olse, where he he speaks to numerous people about the artist, and begins to develop a strange feeling that there is more to the story than the simple version he has been given. It is not long before he becomes something of an amateur sleuth, investigating the death of van Gogh and determined to find answers to his questions. Loving Vincent is the first entirely painted feature film. The first fully painted animated feature film, Loving Vincent (so titled both because the artist signed his correspondence "Your Loving Vincent" as because of the obvious affection the filmmakers have for the artist) is unquestionably gorgeous to look at, with the rich colors and painstaking attention to capturing the style of van Gogh's works creating a marvelous visual feast. Each of the film's 65,000 frames is an oil painting on canvas, created by a team of 115 painters. There are numerous black and white sequences as Armand listens to the recollections of others concerning van Gogh, and this rather conventional technique and the formulaic storytelling style can easily lead one to be dismissive to the idea that it is a truly great film. The obvious heavy influence of Orson Welles masterpiece Citizen Kane is impossible to miss, but what is much easier to miss is that the filmmakers are deliberately paying homage to two great artists at once (once you the thought strikes you that Armand bears a striking resemblance to a young Welles, it's impossible to get the idea out of your head.). Welles may be the father of modern cinema, and the linking of the two artists is very effective. In addition, the film noir mystery element (which is quite involving and moves at a brisk pace_ provides quite contrast to the vibrant colors of the artists work, much as his dismally depressed mind warred with the beauty inside his soul. If the storytelling is not as groundbreaking as the visual technique (and it isn't), that's not necessarily a failing of the film. (And while one can argue that this isn't as ground breaking as it is being made out to be, as the works of Ralph Bakshi and even Richard Linkletter's A Scanner Darkly paved the way long before, but it's the loving, literally hand painted touch that makes this soar.). Douglas Booth as Armand Roulin. Loving Vincent may not be entirely new, but it isn't meant to be. This is a film for those who love and understand art, art history and cinematic history, and it is a triumph from the first painstaking frame to the last. Affordable Franchise Opportunities Best Profit Margin: What Are Your Options?